Randy’s music has been hailed by Downbeat Magazine as “a marvelous kaleidoscope of shifting melodies, rhythms and instrumental colors." He is the Director of the Phillips Exeter Academy West African Drumming Ensemble and North Indian Music Program and taught courses for PSU Integrated Arts Graduate Studies. Randy is the current artist in residence for the Portsmouth Symphony Orchestra. He is the co-founder of Do’a World Music Ensemble, Unu Mondo and Beyond Borders and has performed throughout the world. Randy has presented educational programs for tens of thousands of students throughout his career. Whether he is working with high schoolers at Phillips Exeter or special needs students at the Spaulding Youth Center, Randy brings the same level of passion, professionalism and joy to the art of teaching music. 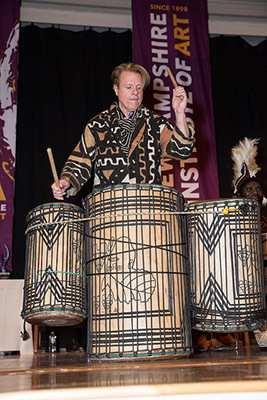 His passionate dedication brings world music to every corner of New Hampshire, to students from kindergarten to adult, to teachers who themselves have never played the tabla or the Lakota flute or the didgeridoo. Randy has served as an Arts Councilor for the NH State Council on the Arts and is on the NHSCA Arts in Education and Arts in Health juried rosters.